The Max speed cannot be reached while towing. With the development of the Defiant, many new technologies and ways of thinking came into play within the Federation. The Grommet class was designed and built out of a growing need for workable recovery solutions within the fleet. A star base can't pick and move to where a damaged ship was, and it was increasingly difficult with the reduced number of ships of the line after the dominion war to dispatch a ship sizeable enough to tow another ship of the line back to someplace where major repairs could be done. In order to satisfy this need for themselves, Star Base 609's repair chief took it upon himself to design a new craft, which he dubbed "The Grommet" half jokingly in light of the Wallace Class vessels common on many different Star Bases. The prototype was built mainly from spare parts left unused after many recovery operations following the dominion war. It used the over-sized warp core of a Defiant Class, and some of their technologies in order to fit what was needed in as small a frame as possible. 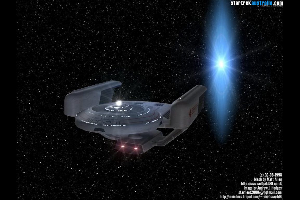 Without the need for weapons, armor and shielding systems such as are required by the Defiant's purpose, the main concern was the Tractor beam assembly and Structural Integrity Field generators needed to be more powerful than most full sized ships. The reworking of existing technologies was required, but was fairly easy to accomplish. Without as many systems to maintain, the crew compliment was quickly reduced from the 50 normally found aboard a defiant to a mere 12 people. With the purpose of the ship, and no real call for prolonged missions, it was quickly apparent that not as many stores or facilities were needed to support the small crew, which resulted in the addition of light shielding and light armaments being re-added into the design. A 4 deck variant of this ship has also been appearing in the private sector. This 4th deck lays between what is normally the 2nd and 3rd decks and is used for additional ship's stores and cargo, allowing the ship slightly more comfort and a time between resupply of 3 months rather than the standard 1 month. Common uses have been asteroid mining and Salvage.